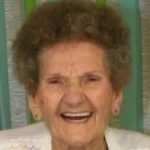 Annanette LaVerne Phillips Martin, 91, went to be with the Lord and Savior, Jesus Christ, Friday August 17, 2018. Graveside Service: 10 a.m. Friday, August 24, 2018 in Hico Cemetery, Hico, Texas. Visitation: 6 to 9 p.m. Thursday, August 23, 2018 at Biggers Funeral Home. LaVerne was born April 19, 1927 in Hamilton County, Texas. She devoted her life to her husband of 65 years, Charles, and their four children, Charlotte, Charlie, Wayne, and Larry. Her passion was her family, and she enjoyed gardening, quilting, and painting. She was preceded in death by her parents, Arthur Lee and Pearl Mae Phillips; by brothers, Charles Donald Phillips and James Durwood Phillips; sister, Aretta Maye Young; spouse, Charles Clifford Martin, and great-grandson, Phillip Martin Benavides. She is survived by her children, Charlotte Annanette Martin and spouse, Ronald Barnard, Charles C. Martin Jr. and wife, Vivian, Lyle Wayne Martin and wife, Kay, and Larry D. Martin and wife, Janet; 20 grandchildren and their spouses; 30 great-grandchildren; and 15 great-great-grandchildren. Service to be held at the graveside. Prayers of peace and comfort going up for the family.